Relationships + Empathy = Learning Community? 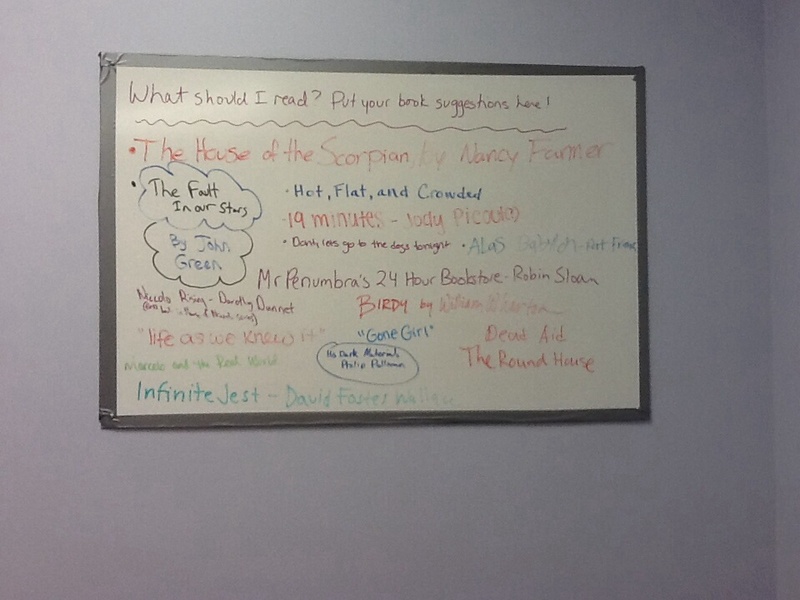 I just finished reading John Green’s The Fault in Our Stars, one of the many books students have written on a whiteboard in my room devoted to suggestions for reading. It is the fourth book on the board I read this fall. I love having the board in my room; it generates conversations about books and reading. It also helps to create a connection between my students and me. I have really enjoyed reading the different books, some I knew about already and some that were new to me. This board is part of my very conscious and open effort to create a community of learners in my classroom, myself included. The more I think about it, the more I believe that relationships are at the heart of successful learning communities. Teachers spend an enormous amount of time looking for engaging lessons and activities, but those tend to be short-term, individual successes. It can be exhausting to try to make the material you want students to learn, in some cases material they need to learn to be able to perform more intrinsically interesting tasks, exciting and dynamic. I have come to believe that a more fruitful approach is to make my classroom a place students want to come. The heart of that is relationships. I want my students to come in to class early, engage in conversation with each other but also with me. I want students to see each member of the class as a resource, someone they can learn from. I think that this promotes student-centered, inquiry-based learning at its best. Relationships build trust and trust brings openness; an open mind is ready to learn. Crossing the divide between teacher and student is a critical component to the relationship. I decided to read what my students love to get to know their world a little better, and because I want them to know that I think I can learn from them. I have been enriched by the books they suggested. Another step I took last year was to shadow a student for a day to walk along with him, experiencing the day as he did. Both have helped me develop some understanding and empathy for my students. Now I am ready to try to take this experiment one step further. I plan to invite my students to craft a mini-curriculum for me second semester. They can suggest homework assignments for me to do. They can provide due dates for me to finish reading books. For those who enjoy learning in other ways, they can assign me movies to watch. I am plenty busy already, so I will need to put some limits if they try to go over board. I teach a few different courses, so it will take a little creativity and cooperation to get all of my classes involved. I have been a student, but not in their world and not of their world. I was feeling a little nervous about this, until I remembered – I trust my students. Looks like I need to get a new whiteboard over Winter Break! If only everyone could double up on history each year, maybe we could come close to an ideal understanding of history. Then again, maybe not. I do it for a living, and I am still not there yet. Building Blocks of the Modern World or Understanding the Modern World – This is how I am envisioning updating our History of the Modern World class. A few weeks ago I was talking with a student about the history curriculum, and he was lamenting that there is no core course in our curriculum that teaches them about their world today. Our 9th grade course is Great Civilizations, which deals mainly with the ancient world. Then students take History of the Modern World which begins with the Renaissance and then moves through World War I. Juniors then study US and the World, a course that focused on the US in the 19th century and the US in a global context in the 20th century before we revised the curriculum last summer. I have been blogging about how we have updated the US and the World course, moving from a chronological to a thematic approach. I will continue to report out on how that is going through the year. But this post is about making over a world history course. I have been reflecting on that conversation with the student. Then, I was talking with a colleague yesterday. She had heard a news story tracing the production of a single t-shirt. This began a conversation about our Commodities Project, where students trace the history of a commodity through time. We shared some great ideas of how we can update that project to make it more fresh and contemporary, including having students look at the origins of final products rather than commodities. We talked about how we could look at contemporary as well as historical products, a cup of Starbucks coffee compared to a cup of coffee in a Viennese coffee house in the 19th century. Students could trace the product from coffee plants to cafe table. Then, it hit me. We can begin with the contemporary issue and then look back to critical formative moments in history that explain it. Globalization issues today can take us back to the Columbian Exchange and the origins of the global trade network. Democratic revolutions today can take us back to the Enlightenment and the Atlantic Revolutions. Industrial and environmental issues today parallel 18th and 19th century industrialization. We would not feel the need to connect everything and cover everything. Instead we would be giving students a grounding in current issues and enough of the background to know historical precedents and foundations. It gets us away from the need to cover everything. Every year, we feel guilty about what we leave out and at some point veer off in a few too many directions in an attempt to draw too many connections. World history is not neat, not clear, not linear. It is a complex web of interlinked stories. Telling all of them is never really an option. We need to be selective. Why not select the ones that have the most relevance for students today? This type of curriculum also allows us to make room for any emerging issues; it is nimble and dynamic. I am excited to share this with my teaching team. Maybe we can even field test a unit at some point in the second semester. I wonder if anyone else is taking a similar approach to modern world history. I would love to hear about it.